ODEX Enterprise is a multi-functional communication software tool. This software allows messages, such as orders, invoices and packing slips, to be exchanged globally in a safe and expedient manner. ODEX Enterprise is suitable for both large and small businesses. The software is scalable, so adding more business partners is a simple matter. Using ODEX Enterprise’s communication software, you can exchange unlimited electronic messages with your business partners, regardless of the various file formats and communication protocols, such as TCP/IP, XOT, FTP, SFTP, OFTP(2) and AS2. Would you like more information about Mail EDI or Excel and PDF reports? Our EDI experts are happy to help. The “Odex Enterprise Email Protocol Component” module (mail EDI) and generating reports in Excel and PDF are extra features within ODEX Enterprise. Mail EDI offers you a way of communicating electronically with your business partners without EDI software. With Mail EDI you can then still exchange messages. Electronic EDI messages are sent and received in a standard format file via email. This file is imported and exported entirely automatically in your application, in the same way as a “normal” EDI message. Excel and PDF reports offer you the option of gaining insight into your current EDI messaging. This gives you a complete overview of your business processes. 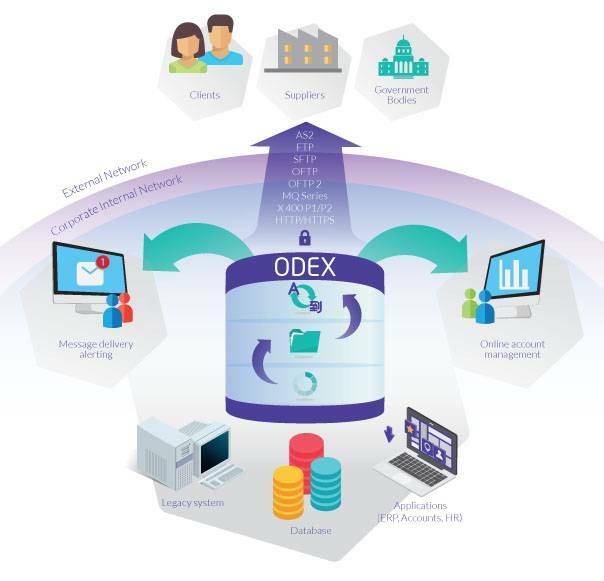 Would you like to know more about ODEX Enterprise, our EDI Communication Software? Our EDI experts are happy to help.